Google has directly approved our usage of permissions we've requested. Note: you must be a Google Admin to authenticate with Google. If you're not an Admin, you can invite a user to the platform to authenticate for you. We need all these permissions to ensure you get a complete view of your SaaS usage and compliance. Read: enables Intello to view all applications that a user has authenticated with Google. Write: gives you the ability to revoke access to applications directly within Intello. Write: allows you to deprovision inactive users directly within Intello. Read: enables Intello to view and manage your G-Suite licenses, ensuring you aren't paying for unused licenses. Read: enables Intello to view more granular G-Suite usage for license optimization recommendations. 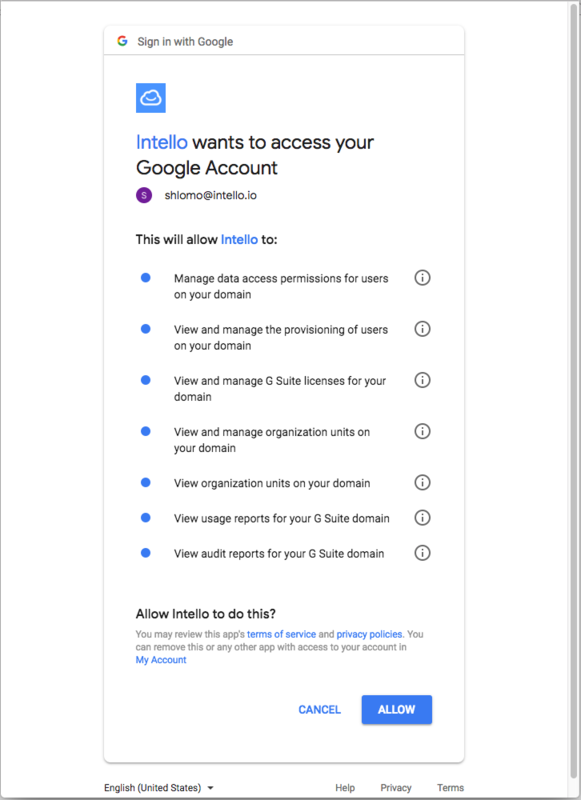 Read: enables Intello to view usage of 3rd party applications connected to G-Suite.